Haley Taylor Schlitz will graduate in May. Photo by Chelsea Mullin/Texas Woman’s University. Haley Taylor Schlitz loves learning and likes standardized tests. She is looking forward to classes this fall at Southern Methodist University's Dedman School of Law. Taylor Schlitz is only 16 years old, but she was in demand for a number of law schools, Texas Lawyer reports. Though Texas Lawyer reports that five law schools offered her a place in their 1L class, she informed the ABA Journal that she was actually accepted to nine law schools in total. Taylor Schlitz’s parents took her out of public school in the fifth grade and began home schooling because they weren’t happy with the education, Schlitz tells Texas Lawyer. Nor was she allowed to take the test to enter the gifted program in public schools. Her parents had her privately tested and found she was gifted. Taylor Schlitz graduated high school at the age of 13. 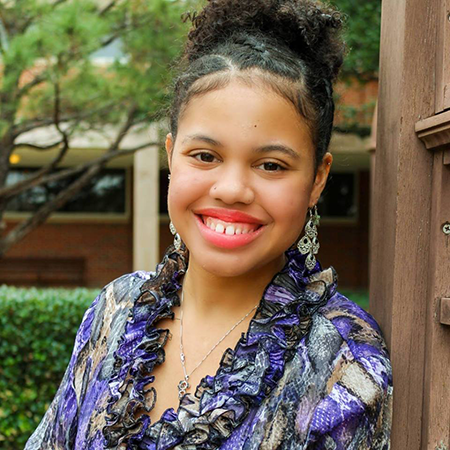 She went to community college and then to Texas Woman’s University. She will graduate in May. At first Taylor Schlitz wanted to be a doctor. Then she realized she wanted to fight inequality. Her experience as a person of color who was denied a chance to enter the gifted program “sparked a fire in me,” she said. Taylor Schlitz tells Texas Lawyer the LSAT was “really fun” because it was more of a puzzle. “I didn’t really see it as a test, per se, but more like a game. It was awesome,” she said. Though she wants to fight educational inequality, she is also interested in intellectual property. “It sounds cool,” she said.